And a whacked out album cover. Not what I expected at all. Of course there is a song named “Beatles and Stones.” That should have been the album title, obvs. Different Gear, Still Speeding will be released in February 2011. Try as I might I simply cannot get into the new Beady Eye song. The tempo is all wrong, the piano is too loud, the back-up singers are hokey and I cringe every time Liam says “ecstasy.” Overall, just a very poor effort. 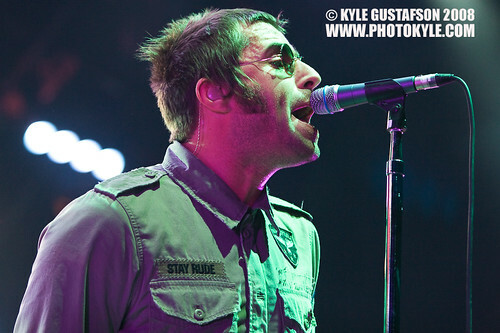 Liam has written quite a few good Oasis songs so I expected better, especially with Steve Lillywhite at the helm. That said, Lillywhite said on his East Village Radio show this week that this song is not indicative of the album at all so hopefully that bodes well for the rest of the album. Beady Eye’s New Song Available Tomorrow! Beady Eye, the new band from Liam Gallagher and everyone else in Oasis not named Noel Gallagher, will make their song “Bring The Light” available for download tomorrow via their official website!